Percy B. Long wore wingtips and rolled his own cigarettes. He managed the Webster Theater in the days before talkies, when trains ran swift and nights settled over plowed fields that spread as if a dark sea from Fort Dodge to Waterloo. Webster City — population about 7,700 — is a miniaturist portrait of a changing nation. An hour’s drive north of Des Moines, the town, shadowed by grain silos, lost its washing machine factory to Mexico seven years ago. Its predominantly white population is absorbing rising numbers of immigrants, many of them Latinos working in meat plants. And, although nearly 60% of this county voted for President Trump, few speak too loudly in support of the tariff and trade war with Europe and China that could cost Iowa farmers hundreds of millions of dollars. The theater, with its 206 marquee bulbs and $4 tickets, is a central character in a story that balances tradition against the tug and pressures of today. Movies here are like notches on door jambs; they mark the passage of time. The American small-town movie house was once an enchanting place of hand-holding and stolen kisses, where films that traced the cultural evolution of a country – from “The Best Years of Our Lives” to “Easy Rider” to “Wall Street” – signified the power Hollywood had on the imaginations of farmers, shopkeepers, mechanics and clothiers spread across Iowa, Kansas, Missouri and other flyover states. Hundreds of theaters shut down over the decades, brought low by the same forces that took away Webster City’s family-owned shoe stores and bakery. 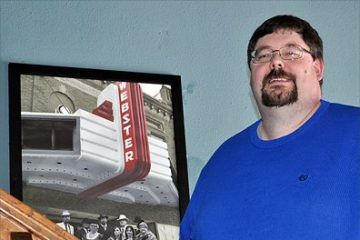 The closing of the Webster in 2013 was a defining moment for Webster City. Built in 1906, the tan-brick theater had been battered by the 2008 recession. When the Electrolux washing machine plant, which at its height employed about 2,200, shuttered and moved jobs to Mexico a few years later, families left too. Storefronts went dark. It was then that Jeff Pingel, who wore plaid shirts and rode a Harley, decided that the Webster — where Hedy Lamarr once flickered luminous and Dan Aykroyd showed up in 1980 to sell tickets to “The Blues Brothers” — could not be lost. He ordered up a business plan from a high school entrepreneurial class and led a fundraising drive with Kay Ross, who with her husband, Larry, ran a saloon. They created a nonprofit and collected $270,000 to buy and renovate the theater. It reopened in 2014. But the town is not the same as when Percy B. Long managed the Webster, marrying a woman who played piano in the orchestra pit, and his son, Tom, an usher, returned from the Korean War and wed Mary Olthoff, a ticket taker. There are more consignment shops. A drop in births is forcing the hospital to shut down its obstetrics unit. Coaches, who order more online these days, are buying fewer footballs and jerseys from Sports World, which decades ago moved into the old J.C. Penney building. The unemployment rate is low, but many of the agriculture, meat and service jobs don’t pay the wages and benefits Electrolux did. Webster City’s demographics began changing in the 1970s when Moun Thongsouk and his family fled communist Laos and found refuge with a local Methodist church. Laotians now make up roughly 15% of the town’s population; they were followed by more recent immigrants from Mexico, Honduras and Guatemala, who work in local meat factories, accounting for about 25% of the population. Their numbers are likely to increase with the opening of a new hog plant near Eagle Grove. Webster City’s sidewalks are snapshots of two worlds: White-haired retirees head to lunch at the Second Street Emporium, while Latina laborers wearing rubber boots and hair nets stroll past Fuhs Pastry Shop, which has gone out of business, and La Perla Jarocha, where Viviana Sosa stands at the cash register beneath a ceiling dangling with piñatas. Conversations over coffee at Whoop-Ti-Doos meandered from immigration — passions around the issue were roused across the state recently when a Mexican immigrant who entered the country illegally was arrested in the slaying of a white University of Iowa student — to any number of topics. Men went on about football, jobs, Democrats ganging up on Trump, garage sales and how “schools have lost their fundamental mission.” One mentioned a “Gunsmoke” rerun “about this bad dude who comes to town,” while another noted the passing of Aretha Franklin and the prospect of a Mexican restaurant opening at the end of the month. 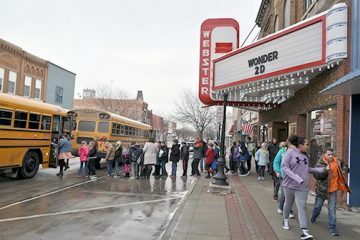 Last Christmas, teachers took grade-schoolers, some of whom had never been in a theater, to see a matinee of “Trolls.” The Webster orders its movies from a broker in Nebraska — a man with a handshake for a contract — and they run about four weeks after they open nationally. Pingel and Ross didn’t know each other before they met to save the Webster. He walked into her saloon one day and said, “Hey, I heard you’re good at raising money.” She lifted her head from the can catcher and said: “Who are you?” He’s a big man with bangs and dark-rimmed glasses; she has sandy hair, a matter-of-fact sense of humor and says things like, “Bob just kicked in $10,000.” Their sentences glide into one another. “The beauty of it had been patched over,” she said. Forty-four tickets were sold. Rider went upstairs — passing a reel-to-reel projector, now a relic — and into a booth with a new digital projector. The theater went dark. The coming attraction was “Mission: Impossible — Fallout.” Tom Cruise jumping out windows. An ad for a Crime Stoppers tip line flashed, another for a Methodist church. “Mamma Mia!,” a musical about a young woman wanting to save a restored hotel in Greece, began. The credits came up over the last song. The marquee lights shone in the night; the theater looked like it did in the 1930s, a piece of magic beneath a half-moon. Something in a scrapbook, but still somehow alive. Rider turned off the lights and locked the glass door. The breeze picked up. A train could be heard in the distance, where the road cut to Fort Dodge and fields rolled to black.